Here are the top hotels for your Snowbird ski trip! Adjacent to the Snowbird ski area, this ski-in/ski-out mountain hotel is 0.6 miles from Mount Superior and 4.7 miles form Cecret Lake. Warm, casual rooms have flat-screen TVs, minifridges, coffeemakers and free Wi-Fi. Amenities include a spa with a fitness center, a yoga studio and a rooftop pool with mountain views, plus hot tubs. There are shops, ski rentals and repair services, and a daycare center. Also a gastropub, a Mexican cantina and a coffee shop. A short walk from the Snowbird ski lifts, this mountain lodge with hotel-style rooms and condo suites is a 2.1-mile drive from the neighboring Alta Ski Area and a 27-mile drive from downtown Salt Lake City. Stylish bedrooms with light-wood furnishings have minifridges, flat-screen TVs and free Wi-Fi. 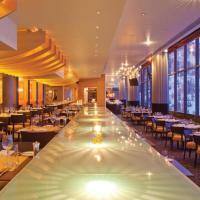 The lodge bistro serves French-American dishes and has a full bar. Leisure amenities include an outdoor pool and hot tub, a steam room, a sauna and a fitness center. 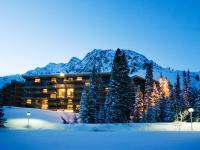 This seasonal mountain hotel, open since 1948, is a 14-minute walk from Alta Ski area and a 1.8-mile drive from Snowbird Ski & Summer Resort. The warm, TV-free rooms, with shared or private bathrooms, have wood-paneled walls. Suites add an additional living area with a sofa bed, plus a fireplace. Amenities consist of a conference center, a woodsy restaurant and bar, a gift shop and ski rentals, as well as a heated outdoor pool, hot tub and sauna.